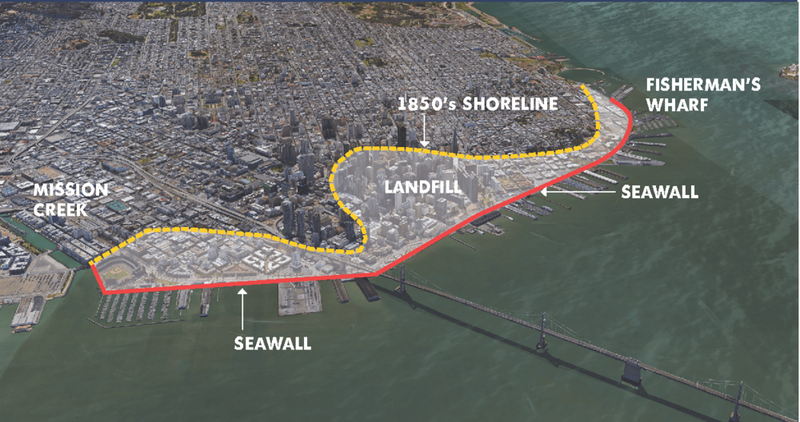 The San Francisco Seawall Earthquake Safety Bond will fund urgently needed repairs to strengthen our Seawall in order to protect our historic waterfront, BART and Muni tunnels, main roads, utility and water systems from flooding, earthquakes, and natural disasters. our seawall is over 100 years old! From Fisherman's Wharf to Mission Creek, San Francisco's Seawall serves a vital role in supporting our shoreline. This important yet unseen infrastructure is one of the oldest in the entire city and was designed before there was a modern understanding of seismic safety standards. Over the last century, while the Seawall has settled, cracked, and eroded, there have been many advances in engineering, technology, and construction practices to better safeguard the city against disasters and rising sea levels. Today's Seawall is in dire need of upgrades so that it can continue to uphold the foundation of San Francisco's iconic waterfront. Yes on A is the first step to funding these much needed repairs. In addition to normal wear and tear, San Francisco's Seawall faces the threat of many natural disasters, which are intensifying every year. There is a 72% chance of a major earthquake hitting San Francisco within the next 30 years and it is likely that the current Seawall will fail, causing extensive damage and limiting emergency response capabilities throughout the whole city. During a major storm, our regional transportation tunnels are at risk of flooding and King Tides already routinely flood the Embarcadero Promenade. With sea level predicted to rise dramatically due to climate change, we must act quickly to protect the over $100 billion in assets along San Francisco's waterfront and coastal downtown. Yes on A will ensure San Francisco is better protected against disasters and flooding. In the event of an emergency, the Embarcadero waterfront is an important location for public safety. It provides both an evacuation route for hundreds of thousands of people and also a drop-off area for critical emergency supplies. Yes on A will strengthen the Seawall and safeguard our evacuation routes and water supply so we are better prepared when disaster strikes. San Francisco's bond program is carefully managed with independent oversight and regular audits, and will not increase property taxes or rents. It requires a 2/3 majority to pass. For more detailed information about Proposition A, please read the Bond Accountability Report here. We urge you to keep San Francisco safe by voting Yes on A on November 6, 2018.